Microsoft and Apple collaborators are still making premiums through the warehouse. 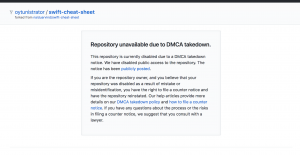 For this reason they have turned off warehouses that do not comply with some DMCA policies. Guys, even when we try to delete the stores, it’s failing. We can not do anything. It is clear from DMCA that this is a ridiculous policy. It was frustrating for us to let such things happen in Github. That’s why I carry all my stores.